Performers include: Jeff Daniels, Emily Mortimer, John Gallagher Jr., Alison Pill, Thomas Sadoski, Dev Patel, Olivia Munn, and Sam Waterston. Created by Aaron Sorkin (The West Wing, Studio 60 on the Sunset Strip), this TV series takes a behind-the-scenes look at the people who put together a nightly cable-news show on the fictional Atlantis Cable News (ACN) channel. The unapologetically old-school president of the news division is Charlie Skinner (Sam Waterson), a professional who learned at the feet of the legendary newsmen. The anchor and managing editor of News Night is Will McAvoy (Jeff Daniels), a moderate Republican whose success is largely the result of never offending anyone. He’s in a lot of pain and that manifests itself in a gruff exterior when he’s off camera. His world is turned upside down when Mackenzie McHale, his new executive producer, re-enters his life. MacKenzie (Emily Mortimer) is a highly respected news producer who was once romantically involved with Will. She returns from 26 months of reporting in Iraq and Afghanistan to executive produce News Night. She hopes to help her former flame to realize his full potential — something that he has little interest in doing. Jim Harper (John Gallagher, Jr.) follows MacKenzie to News Night as senior producer. He served with her in Iraq and Afghanistan and she can’t live without him. Though he’s just 27, he’s more like Charlie Skinner than he is his contemporaries and has followed the news industry since he was a boy. Margaret “Maggie” Jordan (Alison Pill) started at News Night as an intern and quickly rose to the role of associate producer. Her level of intelligence is equal to her lack of experience and lack of confidence. The network’s financial news reporter is Sloan Sabbith (Olivia Munn), a young woman could be earning much more money as an analyst at Goldman, but her calling is economic reporting. Neal Sampat (Dev Patel) writes Will’s blog and scours the Internet for stories and leads that others have missed. At only 21-years-old, he’s a self-made newsman and covered the London subway bombings with his camera phone. Don Keefer (Thomas Sadoski) is the former executive producer of News Night, having taken over the show that follows it. He often butts heads with Will, mostly because they’re a lot alike. He’d love to be on the same quixotic journey as everyone else, but is a realist who understands the business and knows he’s always one ratings point away from being out of a job. As Charlie’s friends and family gather to pay their respects at his funeral, Mac finds out she’s pregnant. She shares the news with Will, who is both elated and nervous for her. He accidentally reveals her pregnancy to some of the other staff and word quickly travels. Jim and Maggie have been together for three days, and Jim recommends Maggie for a field producer role in D.C. Maggie is thrilled about the job prospect, but is put off that Jim isn’t more ambivalent about her leaving town for it. Sloan involves herself in making sure they don’t miss another opportunity to be together. Don and Sloan both feel responsible for Charlie’s death. Don apologizes to Charlie’s widow for what he believes was his role in bringing on the heart attack. She reveals that in every one of the fights Charlie had with the staff since Pruit took over, he was glad they stood up to him. She gives Don and Sloan matching gifts: Charlie’s bowties. Pruit is having PR issues — one of his companies is reportedly paying female employees less money; a separate story revealed he hired models to appear at his birthday party. Leona offers him some unsolicited advice. He doesn’t have a PR problem, he has an actual problem. Neal returns from Venezuela and sees what’s become of ACN Digital. He remotely shuts down his replacements’ computers mid-story and chews them out for ruining everything he built. They’re going to shut down the site for a week and rebuild it. At the reception after the funeral, Will spots Charlie’s grandson playing a standing bass in the garage. He joins him on guitar and they play “That’s How I Got to Memphis,” a song Charlie introduced him to. At Leona’s urging, Pruit promotes Mac to Charlie’s role as network president. Don wants to stay at 10 o’clock, so Jim takes over as the new executive producer at ‘News Night.’ He offers Maggie his old job as senior producer so she can stay in New York, but she still wants to pursue the field producer position in D.C. They’re going to try to make it work long distance. Three years earlier, Charlie watched Will peddle soft news for ratings and likability. Upset that his news channel wasn’t doing the news, he sought out Mac. Fresh from Afghanistan, she spent her afternoons drinking at a bowling alley. Mac brought Jim on board, and helped facilitate Will’s rant at the panel at Northwestern. First aired: December 14, 2014. What do you think? 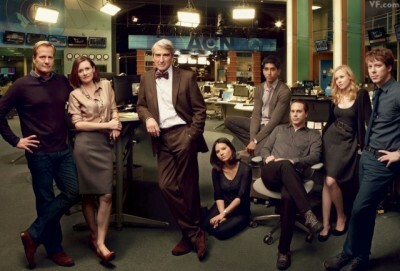 Do you like The Newsroom TV series? Do you think there should have been a fourth season? I am so mad Newsroom got cancelled. I was down for a long-term relationship with this show. I was literally heart broken when it did not come back. My heart jumped out of my chest and broke into pieces. I do not understand why it’s no longer anywhere. It was one of the best shows I have ever watched. Sorkin is the bomb. Yes there should be a season 4….This is the best series I have ever watched…do not, and I repeat do not kill this series…Please!!!! You know , I am amazed by the killing of great shows, this show would be good for the new regime of Trump, talking about Truth in news, for this administration doesn’t know what is a lie is, Please bring the Newsroom Back to do battle with this man named trump, with a little t.
Wonderful series. Aaron Sorkin is brilliant. So very sorry The Newsroom ended. It was intelligent, interesting — of course, well written — and informative. There is such garbage on TV now. Reality TV shows are mind-numbing. Shows the caliber of this one, and my all-time favorite, West Wing, no longer exist.